Why should the leper obey Jesus and go to the priests? The law made him an outcast in the first place. So he doesn't do it. Instead he proclaims his own good news. 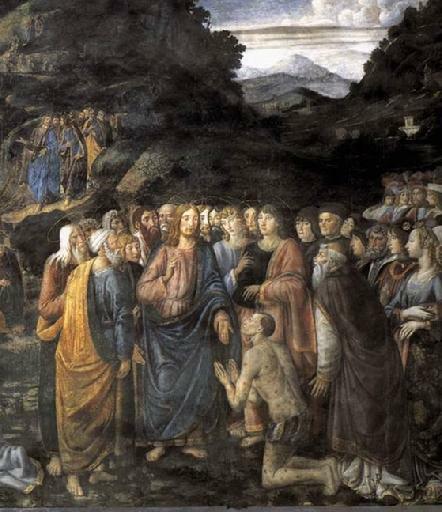 Furthermore, the leper, through this confrontation, renders Jesus unclean. Now, both men are outcasts. Greek readers and Biblical scholars say Jesus is angry in this story, and even "snorts" like a horse. Is Jesus angry at the horrible disease, the marginalization of the sick, or at this situation setting in motion so early in his ministry the sequence of events leading to his own death by torture? Jesus, moved with "pity" (anger), breaks the sacred purity laws and touches the leper. How can he be holy if he touches what is not holy? Jesus’ action speaks for itself: How could he be holy if he did not? This week's meditation concerns the imperative to imitate Jesus. "First, have a habitual desire to imitate Christ in all your deeds by bringing your life into conformity with His. You must then study His life in order to know how to imitate Him and behave in all events as He would" (John of the Cross). To look deeply into others to perceive the image and likeness of God inside addiction or mental illness, for example (meditation one). And even go so far as to see God's beauty in the marginalized, and to seek out the presence of God in suffering humanity (meditation two). And then, imitate him (meditation three). J. Philip Newell, in Christ of the Celts, tells of dealing with the psychotic breakdown of his 16-year-old son. "I was overwhelmed," says Newell, "by a sense of not knowing what to do to help him." But even when he witnessed his son’s paralyzing fears, Newell never confused his son’s illness with the boy’s deepest identity. "I did not assume that [the illness] was his true nature," says Newell. Newell likens it to something he learned from Alexander Scott, a nineteenth-century Celtic teacher, in the analysis of a plant with blight. "If such a plant were shown to botanists, even if the botanists had never seen that type of plant before," writes Newell, echoing Scott, "they would define it in terms of its essential life features. They would identify the plant with reference to its healthy properties; they would not define it in terms of its blight." The take-away for me is to not define others by the blights I sometimes see. The alcoholic is not his alcoholism; the addict is not his addiction; the person with mental illness is not the illness. We, all of us and each of us, have been created in the image and likeness of God (see Genesis 1:26-27). We have come to accept the inscrutability of inspiration, the sudden moment of illumination, the unforeseen leap of imagination that occurs in the expression of human genius. Archimedes, Kepler, Newton and Einstein in science have their artistic counterparts in Homer, Shakespeare, Mozart and Monet. The only thing we can say for certain about their moments of epiphany is that their precise source cannot be rationally explained; the person enlightened is perhaps astonished most of all. There are many such stories throughout history and in every culture; each of them changed lives past counting. In nursing the world's outcasts, Francis had begun to rise to the genuine nobility he has long sought, which was to be discovered not in armor, or in titles or battles, glory or contests. Honor would be found not in associating with the strongest, the most attractive, the best dressed or the most secure people in society, but with the weakest, the most disfigured, those who were marginalized, dependent and despised. The heart outstrips the clumsy senses, and sees … an undistorted and more veritable world. All things are perceived in the light of charity, and hence under the aspect of beauty: for beauty is simply Reality seen with the eyes of love. The highest emanation of all beings, taken in their natural order, is through the noblest beings to the lowest, but their refluence to their origin is through the lowest to the highest. Therefore, if thou art wishful to behold Me in My uncreated Divinity thou must learn how to know and love Me here in My suffering humanity for this is the speediest way to eternal salvation. Perhaps he had a lingering memory of the dying at the little clinic of San Giorgio; in any case, he did not flee in horror as before, but instead approached one the the most lame and pathetic of the group. With no money to give and no food to share - for he, too, was reduced to begging - Francis knelt down and gave what he could: an embrace, a bit of comfort, a few sympathetic words. 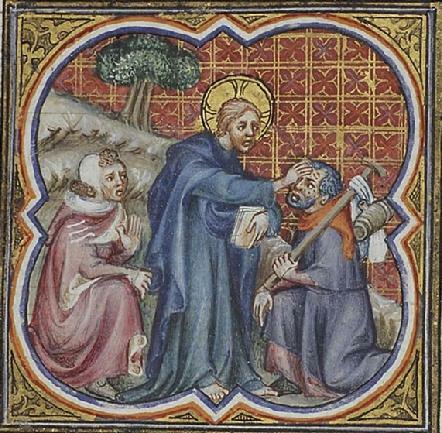 Francis would almost certainly have remembered the New Testament accounts in which Jesus healed a leper. "Moved with pity, Jesus stretched out his hand and touched him," which must have shocked bystanders as much as the cure itself did. With this single act of charity, Francis was apparently transformed, for when he returned to Umbria he not only resumed his restoration of San Damiano but also began to nurse lepers, a task rarely undertaken by anyone. This involved not only begging food on their behalf and feeding them, but carrying them to a nearby brook or stream to wash their sores. "For God's sake, he served all of them with great love. He washed all the filth from them, and even cleaned out the pus of their sores." His care, in other words, meant more than merely not showing revulsion. It meant taking with grave literalness the standard of the Gospel that to minister to the needy was to minister to the lonely, naked and dying Christ. God forces no one, for love cannot compel, and God's service, therefore, is a thing of perfect freedom.